This new and forever growing thread is devoted to new literature relevant for tryptamine / lysergamide chemistry. Let's discuss these papers in separate threads for a better overview. Heterocycles 51, 1131 1999 H. Sakagami, K. Ogasawara: A new synthesis of psilocin. 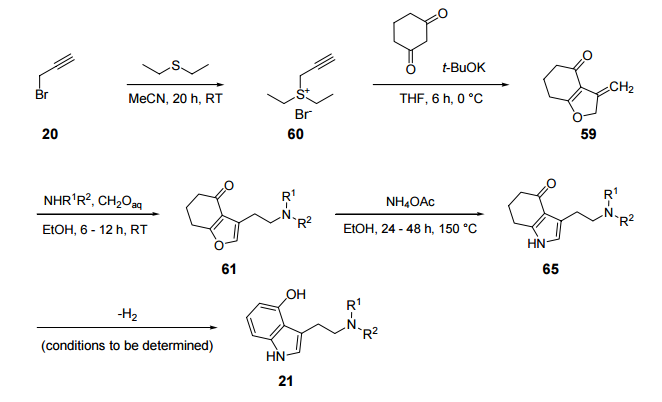 A seven-step-low-over-all-yield-very-complicated synthesis. J. Chem. Soc. Perk I 1045 2000 G. W. Gribble: Recent developments in indole ring synthesis - methodology and applications. Great review articel covering the whole modern indole chemistry. Someone (I forgot who) already mentioned this article at the old board. Four steps from 4-benzyloxyindole in 79% overall yield. Also includes an improved synthesis of psilocybin from psilocin (hard work, 46% yield). What about the book 'LSD 25 and Tryptamine Syntheses' by O. Snow ? I didn't like his book on amphetamines much but the reference section was good. The new Psilocin/Psilocybin/4-acetoxy-DMT synthesis by nichols is now available at my site (Thanks Omnipage 10, the only thing I had to correct was Et2O and CH2Cl2, which was interpreted as EzO and CHzCIz). What are the best routes to take DMT, DET, MET, DPT and add ACO-, HO-, PO- on the 4 position? I cannot find literature for each of these. I did not want to write all 12 out. Thanks. Some are known in Tihkal. Others have never been produced in literature. Also looking for ALZ, AL-LAZ, and 1P-LSZ. The attached paper was kindly showed to me recently, it contains some good information.